in so many words...: Another Birthday. Another Decade. Just a brief glimpse of how I'm spending my birthday today. Same/old. Same/old. Glamour, glamour, glamour...it does get boring after awhile. But I'm bearing up. Ha! Happy birthday, my dear. Very dashing gent in that painting. And you look lovely. Just make sure you leave with the one that brung ya'. May I wish you a very happy Birthday, Yvette. I trust you will spend time doing things that give you pleasure and that you are surrounded by friends and family! Jacqueline, did you see the enlarged version? Is this not a fabulous painting? I mean - WOW! Yes, I must take care to leave with the guy with the cigar. He looks prosperous. Ha! Thank you, Sue, m'dear. I'm going out to dinner tonight (just like in the painting - ha!) with family. I'm looking forward to it. This is a BIG birthday. Beginning of a new decade. Thank you, Mark. I hope so as well. :) Can't believe I made it this far. Having done so, the rest should be duck soup. Happy Birthday, Yvette! God bless you with health and happiness always. I hope you have a great year ahead!! Hey, Yvette, although I've already expressed my bountiful birthday blessings to you, good news is worth repeating, kinda like in that CITIZEN KANE trailer: HAPPY BIRTHDAY, YVETTE! All of us here at Team Bartilucci H.Q. hope you have a wonderful day with all the people and things you love, my friend! Happy, happy birthday to you Yvette! Have a wonderful day! Happy birthday, Yvette. Wishing you many great books (and movies) and plenty of leisure time in which to enjoy them! I send my best wishes for health and happiness, good books, art, music and movies for the coming years. And thank you so much for this wonderful gift of a blog which you bring to your readership and which we appreciate. Here's to many more fun-filled B'Days. Happy Birthday, Yvette! Wishing you many, many more. A very, very Happy Birthday to you! And a wonderful year until next one! Thanks so much everyone!! I had a wonderful birthday - an amazing dinner out with family (including my little granddaughter) and very nice prezzies: some turquoise bling and a shopping bag full of deliciousness - all the necessaries for afternoon tea! And yes I had cake. You're never too old for cake! It was a BIG birthday - I'm beginning a new decade and feeling pretty good. I'm glad I'm still around. I know I said Happy Birthday on FB yesterday but I wanted to come by and say the same thing here. I hope you had a wonderful birthday! Thanks, Ryan! I must admit, my flashy silver sequinned grown did fit a little tighter by the end of the evening. And the red rose was drooping a bit. But, I soldiered on. HA! Glamour hardly covers it. You could give Lily Rowan a run for her money! Don't I wish! Ha! Thanks, C.W. So glad you have a wonderful birthday and that your grand-daughter brought joy. More turquoise bling is a great present, and delicious things for tea. Great gifts -- and birthday cake, too. It sounds as if a terrific time was had by all, especially the birthday honoree. Beautiful, beautiful painting, and what a smashing dress, dahling. It was. :) The gown? Oh, just a little something I threw on at the last minute. Ha. I hope you had a wonderful birthday, Yvette! 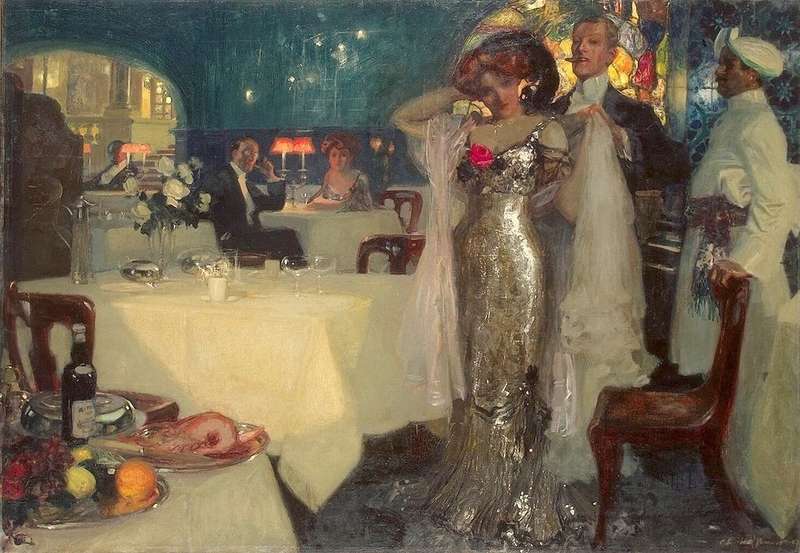 Did you wear your sliver ball gown like the elegant woman in thsi painting? A belated Happy Birthday to you (because I have been knee deep in grading papers these few weeks). Hope you had a great time on your birthday. At any rate, thanks. I had a great day. I hope you did too. Geminis of the world UNITE!! Thanks, Willow. I had a great day indeed.